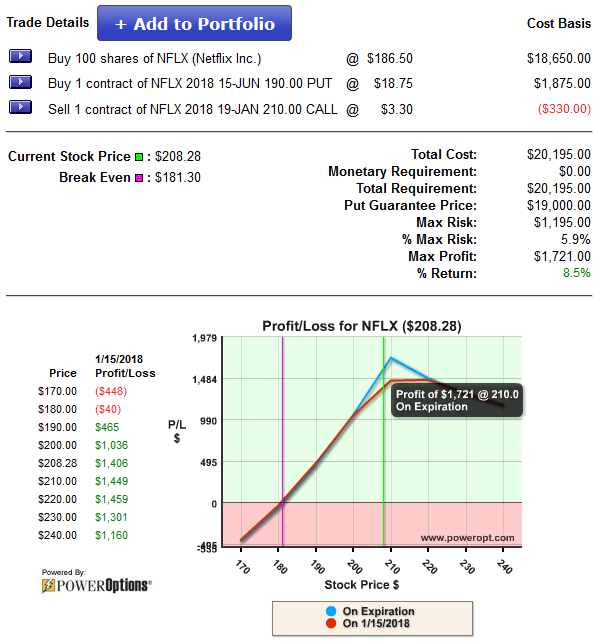 In this case study we take a look at a customer’s RadioActive Trade on NFLX – similar to the Fusion Trade that was opened on Nov. 16th. This a good structured, low risk RadioActive Trade. Now, Myles wanted to know if selling a call, Income Method #1 of the 12 different income methods, was the right approach. Idea: Sell the 2018 19-JAN 210 call at -$3.30 (Income Method #1). This would reduce the risk below $12.00 per share, leave some upside to $210 (for 14 days), and have a reasonable profit. BUT! It would also cap the upside. We have reduced the risk to $1,195 – or only 5.9% of the investment. 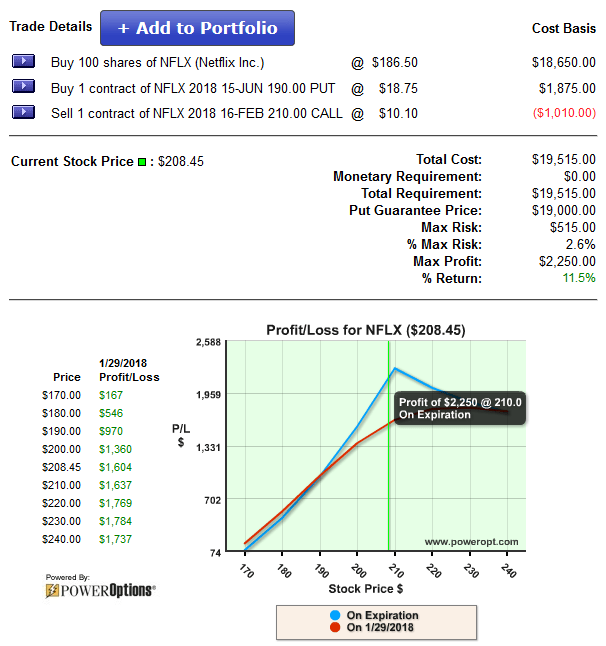 The potential profit, if NFLX is trading right at $210 on JAN 19th is $1,721, or 8.5% (and increase of 2% over liquidating now). This adjustments limits the risk, potentially increases profit…but caps the upside. This is what I showed Myles. Of course, a 2nd thought comes up: Why not get more by selling the further out, 2018 16-FEB $210 call at $10.10? That’s right…$10.10, cutting the risk down to only $5.15 or 2.6% – and having higher profit (potentially). We get close to $7.00 more by adding an additional 30 days of time. We cut the risk down to less than 3%, in the worst case scenario. Good outcomes…but the gain is still capped. And I said the 2018 19-JAN call is better than the 2018 16-FEB call. Why would I tell Myles this? Well, NFLX has earnings coming out on January 22nd – 3 days after JAN expiration, and 27 days before FEB expiration. If we are bullish on NFLX…we might not want to have that upside gain capped through earnings. Can we get the risk below 3%, without capping the upside through earnings? Yup. This is what I discussed with Myles. There are two working assets in a RadioActive trade: The stock, and the ‘Protective Put’ that is just insurance…or is it? Myles paid $18.75 for the 2018 JUNE 190 put. The stock has moved up $22.00 – but the put did not go to $0.00. It is currently at $10.15 or so, a loss of just over -$8.00. What does this mean? The price of the put was already factored into the total cost basis (already accounted for). 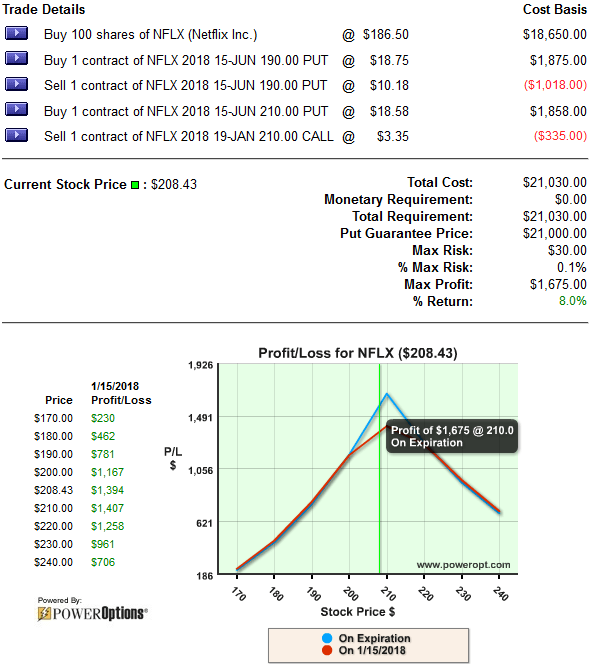 As the stock moves up, the put value declined…but so did all puts on NFLX. Wait, why would I want to add to the total cost basis!!! NEW Max. Risk = $ 3.65, or 1.7%! And, there it is. The upside remains unlimited – no capped gains. This risk is dropped below 3%…even below 2%. The monetary at risk is down to $365.00, from $1,525.00. 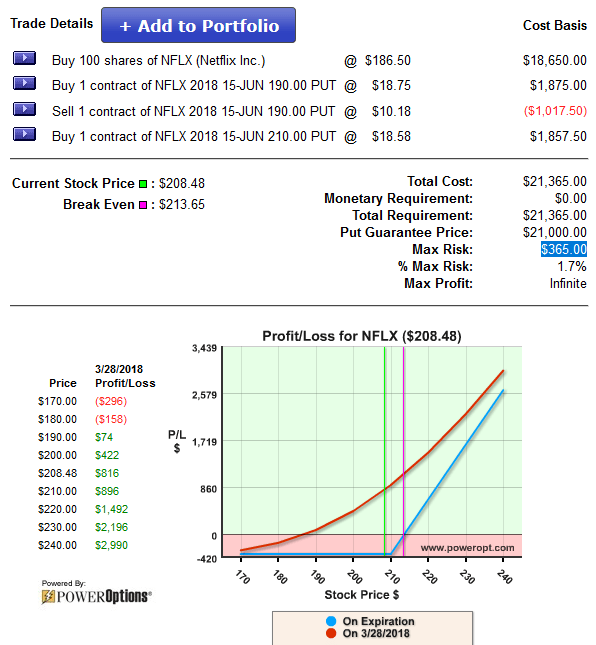 Even if the earnings disappoint, and NFLX drops to $190 or lower, this position can not lose more than 1.7% of the investment…the TOTAL investment including initial put cost, and additional debit to roll. Wait…There is More to This Case Study! Earnings aren’t coming out until January 22nd…after the standard January expiration. Remember that 2018 19-JAN 210 call? Priced at about $3.30? What if NFLX stays in this $208-$211 range in the next 14 days, prior to earnings. What if IM #4 was applied…and then IM #1 was still used for JAN expiration? New downside risk is $30…that’s $0.30 per share…or 0.1%. We give up some upside profit by rolling the put…but we also take out almost ALL of the risk. There is virtually no downside risk to this trade heading into earnings…with an unlimited upside! That shows the benefits of RadioActive Trading. Shows the benefits of controlling risk – where the put is not just insurance but a 2nd asset that works in your favor. Shows the power of having 12 different income methods in your trading arsenal – and the power of combining income methods (a full chapter in The Blueprint). The risk can be lowered below 2% without selling a call, leaving the upside open. Oh, and another combination could be used with IM #4 to generate income, bulletproof the position AND leave the upside open through earnings. But, that is for another time. Again, the power of 12 different income methods….And the power of RadioActive Trading. This is really wonderful thinking and planning Mike. Very well done. I love case studies like this, learn so much from them. Keep doing them! Why does this trade need any adjustment now? NFLX (and the entire stock market) is in a clear uptrend. 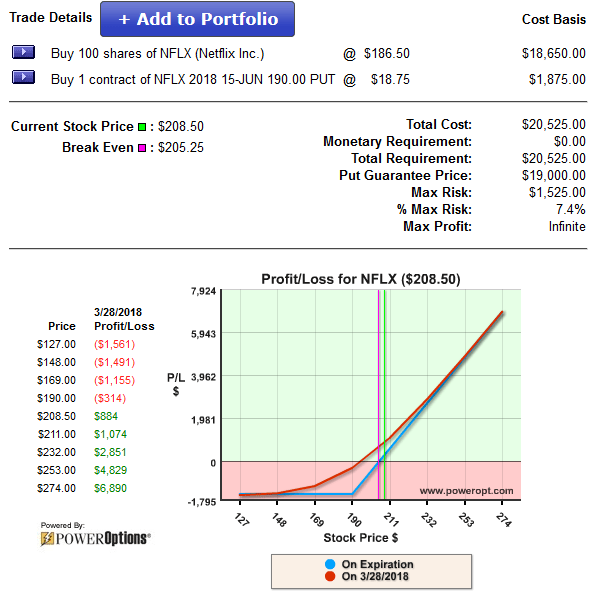 NFLX is up another $3 since this blog was written. There is, of course, a risk that the stock could fall on earnings. That’s why the $190 put was bought in the first place. The risk is already limited. IM #4 is a good strategy for limiting risk, but not a good strategy for maximizing gains. I see no reason to roll the put at this time. It’s a poor strategy to aggressively put more money into a trade. I see no reason to sell a call now, either, since the stock is moving up. If I did sell a call, I would sell a call that is far OTM. The Jan. 26 ’18 options have high IVs because they expire right after earnings. The Jan. 26 ’18 $225 strike call can be sold for almost $4. I might sell a call like this one because it leaves room for the stock to run and reduces my risk. – low IV when stock is generally rising, so higher probability of getting to the put strike.